What Would It Be Like to Live on Mars? Putting boots on Mars is the chief long-term goal of the international human spaceflight community. The idea of living on Mars has been a staple of science fiction since the 19th century, when American astronomer Percival Lowell speculated that the channels on the Red Planet were really ancient canals built by intelligent extraterrestrials. But if this sci-fi dream were to ever become reality, what would it be like to actually live on Mars? Conditions make living on Mars extremely challenging. 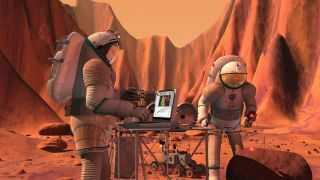 See how living on the Red Planet would be hard in this Space.com infographic. NASA is now planning for a manned mission to Mars, which is slated for the 2030s. It's unknown where astronauts will land on Mars for that mission, but for a future Martian space colony, "you'd probably want a permanent base somewhere in the low northern latitudes," Ashwin Vasavada, a deputy project scientist for NASA's Mars Science Laboratory, told Space.com. Like Earth, Mars has seasons due to the planet's tilt upon its axis, but it also has a secondary seasonal effect because of its highly elliptical orbit. The southern hemisphere is pointed away from the sun when the planet is farthest from it, resulting in far colder winters (and far hotter summers) than those in the northern hemisphere. The average temperature on Mars is minus 80 degrees Fahrenheit (minus 60 Celsius), but temps can range from minus 195 F (minus 126 C) in winter near the poles to 68 F (20 C) during summer near the equator. The temperatures can also change dramatically within a single week. Mars' temperature variations often result in powerful dust storms, which can sometimes shroud the entire planet after just a few days. Though these storms probably wouldn't physically harm you, the dust could clog electronics and interfere with solar-powered instruments, Vasavada said. "The No. 1 thing an astronaut would be worried about is the radiation from space," Vasavada said. Unlike Earth, Mars doesn't have a global magnetic field and thick atmosphere to protect its surface from radiation. If you were to experience some unfortunate incident, a message sent home to Earth would take an average of 15 minutes to get there. While not terribly long, "it's definitely annoying enough that it'd be hard to Skype with anybody," Vasavada said. With these clear skies, the Martian night is full of stars. Amateur astronomers would want to look out for Mars' moons, Deimos and Phobos, which can come out at the same time. These satellites, both of which are far smaller than Earth's moon, can also partially eclipse the sun during the day. The daytime sky generally has an orange tint to it because of all the dust, Vasavada said. Sunrise and sunsets look similar to those on Earth during a very hazy day, except that the area around the sun is blue. The surface of Mars offers up a few great opportunities for sightseeing. "If we were to completely colonize Mars, there are certainly places that would become national parks," Vasavada said. For example, Olympus Mons is the tallest volcano in the solar system, reaching 16 miles (25 kilometers) above its surrounding plains. Valles Marineris, on the other hand, is a giant system of valleys about the distance from Los Angeles to New York. And you'd also probably want to visit the Viking landers and Mars' tremendous polar ice caps, which sometimes get dry ice snowfall, Vasavada said. But with a gravity that's only 38 percent of Earth's, getting around on Mars would be challenging at first. "Running and fast movements would probably take quite a bit of relearning," Vasavada said. "But it'd be better than moving around on the moon." Editor's note: This is Part 3 in Space.com's 12-part series "Living on Other Planets: What It Would Be Like" to see what an astronaut would see on other planets and moons of our solar system and beyond. Check back each Tuesday to see what humans might encounter on other cosmic bodies in the universe. Follow Joseph Castro on Twitter. Follow us @Spacedotcom, Facebook and Google+. Original article on Space.com.